I wrote this on my Facebook a while ago and completely forgot to put it here too! I never thought I’ll face this moment again this year, but…today, I crumbled. Every part of me shattered into a million pieces at the start of class and I couldn’t glue them back even till after the bell rang. I entered my challenging class today with so much enthusiasm because I’ve prepared hard for it and I know that despite it being the last two periods, I WILL succeed today. Barely 10 mins in, everything started falling apart. They kept talking and interrupting my lesson and after I told them that we will do some fun activities with the newspaper, they said they don’t want to do anything but sleep. I was mad but tried encouraging them further anyway. Then, what transpired next was probably the longest hour of our lives. I just wrote and wrote essays after essays on the board for them to copy. My chalk finished and I went to the next class to borrow some and continued writing. That’s what other teachers do and if they don’t want to enjoy my class filled with simple fun activities then I’ll do the same too. Kids began complaining and whenever they did, I wrote their names under WARNING and they immediately kept quiet. All 28 kids wrote three 200-word essays in silence till the bell rang, all but one boy. Before letting them go, I’ve calmed down so I told them that if they don’t want to learn the nice way next time, it’ll be essay time again. Most of them apologized for their behaviors and left. I told that boy who slept through the class to stay behind to do the essays. He said no he won’t. I pulled a chair and sat next to him “I won’t leave till you do”. Then, nonchalantly, he took his bag from me and walked out of class while muttering “don’t waste my time”. Dumbfounded, I choked back angry tears and just sat and stared at his empty book for 30 mins, wondering what else can I do with this boy whom I’ve put SO much effort in for months cause he’s always been difficult. I started tearing because I know I’ve completely lost the battle with him. I give up, you win. 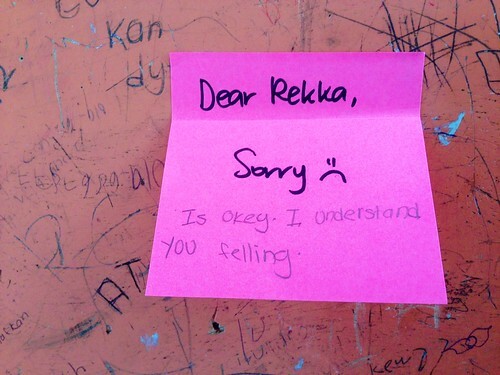 Then, I went to pack my things and saw this on a girl’s desk. During the whole dictatorial copy-this-down stint, I’d slipped this note to students who were good and who wanted to learn. I felt so bad that they had to endure this because they didn’t do anything wrong. She wrote this in reply and left it on her table for me to see. When I saw it I just broke down like crazy and started crying and crying. I’ve already taught this class for almost two years and I’m leaving soon and I have no idea if they’ve learned anything from me. There are so many of them who wanted to learn but I’ve completely disappointed them today. Tears were just streaming down my face. Angry tears for my failures, sad tears for my kids’ future, frustrated tears for my wasted efforts, and relieved tears for this girl who did not give up on me. Seriously, how the hell did movies like Dangerous Minds and Freedom Writers make things look soooo easy?? UPDATE: At 8pm the night after this incident, I had my first night reading session. Guess who showed up? Yes. The boy who told me not to waste his time. He lives pretty far away and got his dad to send him anyway. He said he was just too tired in school and that he wants to learn now.